I wrote about some similar liners in the past (Rimmel and Avon) and they were not bad at all, but this one has blown them both away. 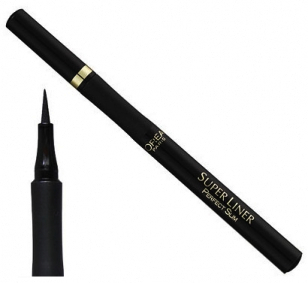 Priced at around the €9ish mark, the Super Liner Perfect Slim is a brilliant pen-type liner with a super-fine felt tip (0.4mm), which is great for precision work, super-skinny eyeliner, body art/fake tattoos, you name it. It has quite slim packaging, so it's easier to hold than most (as it is more or less the same size as an eye brush), and it also has a rubber grip. I've been using it almost every day since the start of December and thus far it hasn't dried out or used up. I don't seem to need to shake it before use. It is a properly opaque, very pigmented, black-as-black liner which goes on black, stays black and doesn't fade. One sweep is enough for full opacity. Unlike most of these type of eyeliners, it also works nicely for tight-lining, likely because it dries quickly. It doesn't smudge, it doesn't budge, it doesn't fade. It doesn't need setting as it dries quite quickly. It can settle into lines a little bit if your eyelids are crepey (but not as much as the Rimmel or Avon offerings). It has a matte black finish and is long lasting. It needs a decent eye makeup cleanser to remove it. Look here for more information. I will be re-purchasing when I've run out, unusual for me, because I am not usually a fan of these types of eyeliners. Recommended!